(PhysOrg.com) -- By setting up a unique experiment, a small team of researchers has found that chimpanzees are able to understand need in other chimps, despite their general disinclination to offer aid when they see it. Shinya Yamamotoa, Tatyana Humleb, and Masayuki Tanakac set up a way to test their idea that chimps are able to understand some part of what is going on in the minds of others around them, and as they describe in their paper published in the Proceedings of the National Academy of Sciences, they found a way to demonstrate it. Chimps have a reputation in the human community as being rather unhelpful to one another. Researchers in the past have often ascribed this characteristic to an inability to understand what may be going on in the minds of other chimps that may be experiencing a need, or looked at another way, an inability understand that another chimp could benefit from their assistance. This new research debunks that thinking and shows that chimps are indeed capable of comprehending a problem another is experiencing and are willing to help, but generally only if asked. To make this discovery, the team enlisted the assistance of five chimps living in the Primate Research Institute in Kyoto, Japan. There they housed mother and offspring pairs in adjoining booths and set up one with a problem and the other with a set of tools, one of which could be offered to the other to help them solve their problem; a straw to allow for drinking a juice box for example. The researchers chose mothers and their offspring for the experiment because they felt if any two chimps would offer assistance to one another it would be those in such a relationship. In the experiment, the researchers set up the experiments such that sometimes the mother was the one in need of assistance and the offspring the one that could provide it, and sometimes vice-versa. They also ran the experiment in two ways; one where the two chimps could see the other clearly and thus the problem at hand, and the other where they could not, meaning they’d have to offer assistance based on being asked for it and nothing else. As the experiment ran, the researchers found that no assistance was offered by any of the chimps unless it was asked for by the other. And the other asked for assistance by shoving their arms though an opening in the wall between them or clapping their hands or waving at the other. Furthermore, they found that if the chimps could see each other, the one being asked for aid generally chose to offer it, and was able to choose the right tool to assist the other eighty to a hundred percent of the time, which showed they understood the nature of the problem the other was experiencing and thus were able to offer the right kind of help. In cases where the two could not see each other, the one with the problem still asked, and the other more often than not tried to oblige by offering the tools up one after the other in random order. The research teams suggests this is an example of “theory of mind” which is an ability to “get” what another is experiencing or having some understanding of the mental state of someone else. A trait that until now, has been thought to be limited to us humans. Humans extensively help others altruistically, which plays an important role in maintaining cooperative societies. Although some nonhuman animals are also capable of helping others altruistically, humans are considered unique in our voluntary helping and our variety of helping behaviors. Many still believe that this is because only humans can understand others goals due to our unique theory of mind abilities, especially shared intentionality. However, we know little of the cognitive mechanisms underlying helping in nonhuman animals, especially if and how they understand others goals. 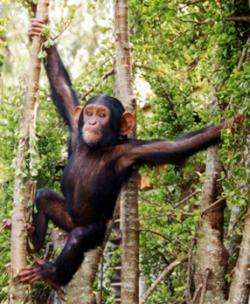 The present study provides the empirical evidence for flexible targeted helping depending on conspecifics needs in chimpanzees. The subjects of this study selected an appropriate tool from a random set of seven objects to transfer to a conspecific partner confronted with differing tool-use situations, indicating that they understood what their partner needed. This targeted helping, (i.e., selecting the appropriate tool to transfer), was observed only when the helpers could visually assess their partner's situation. If visual access was obstructed, the chimpanzees still tried to help their partner upon request, but failed to select and donate the appropriate tool needed by their partner. These results suggest that the limitation in chimpanzees voluntary helping is not necessarily due to failure in understanding others goals. Chimpanzees can understand conspecifics goals and demonstrate cognitively advanced targeted helping as long as they are able to visually evaluate their conspecifics predicament. However, they will seldom help others without direct request for help. Which raises the question not noted above: why are chimps so unhelpful. They see others need aid but ignore this. Why do not their cognitive abilities translate into cooperation? Also oddly as the authors note "our results showed that chimpanzees helped others upon request even without proper knowledge of the others needs". This questions how deep is the the understanding they have of the others' situation. Agreed, perhaps something to do with the social structure? Or perhaps it is limited to cooperation but not empathy? As in "I can tell what you are trying to do, but not how you feel about it"(dying of thirst for the juice, etc). May I suggest a further resource to learn more about empathy and compassion. The Culture of Empathy website is the largest internet portal for resources and information about the values of empathy and compassion. It contains articles, conferences, definitions, experts, history, interviews, videos, science and much more about empathy and compassion.